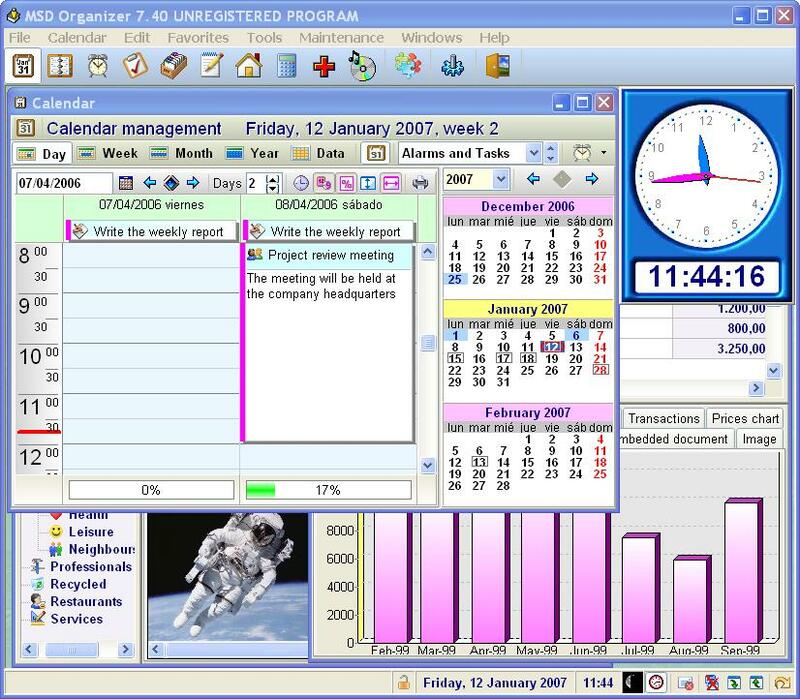 MSD Organizer Multiuser is a complete, powerful and easy to use personal and professional information manager for networks, with calendar, alarms, tasks, contacts, personal diary, property, budget, health and music. MSD Organizer Multiuser also provides the following tools: backup and restore, network messenger, word processor, image viewer, calculator and financial calculator.Backup and Restore tools, to keep your personal information safe. * The Network messenger allows to send private or broadcast messages to other program users in the local area network. The messages are stored in trays like in the mailing programs. * Provides tools to communicate with the contacts by phone, web, electronic mail and SMS messages, and allows to send customizable emails to contacts and email lists. * All the records in the program modules can contain an unlimited history. The possibilities of this unique feature are countless. * Favorites support. The user can define program records and groups as favorites, as well as folders, programs, documents, phone numbers, web addresses, email addresses and user defined favorites. * The user may configure the behavior and visual appearance of the program. * Easy to use, with windows with similar functionality and controls designed for a short learning curve. Keep track of important dates and appointments. Black Hole Organizer is a great helper for your notes and text organizing. Qweas is providing links to MSD Organizer Multiuser 11.2 as a courtesy, and makes no representations regarding MSD Organizer Multiuser or any other applications or any information related thereto. Any questions, complaints or claims regarding this application MSD Organizer Multiuser 11.2 must be directed to the appropriate software vendor. You may click the publisher link of MSD Organizer Multiuser on the top of this page to get more details about the vendor.